December 29, 2015 - Just after 6 AM this morning, A Civil Air Patrol (CAP) aircraft crashed into two office buildings in Anchorage Alaska killing the pilot. At this time it is unknown if any one else was onboard the Cessna 172, (N914CP) the pilot has been identified as 1st Lt. Douglas Lawrence Demarest. Upon impact, the aircraft was completely destroyed and burst into flames causing major fire damage to the two downtown office buildings on West Fourth Avenue. In a statement, the Civil Air Patrol reported the pilot was not on a Civil Air Patrol flight and was not authorized to fly the aircraft. Demarest joined the CAP in 2010, he held a private pilot certificate in a airplane single engine land and instrument airplane rating. Officials report they do not believe the crash is related to terrorism as witnesses reported the aircraft sounded like it was having engine problems just before the crash. However, the FBI will be assisting in the investigation. National Transportation Safety Board Alaska Region Chief Clint Johnson said, "Some evidence warrant us bringing them into the investigation." Johnson declined to elaborate further. 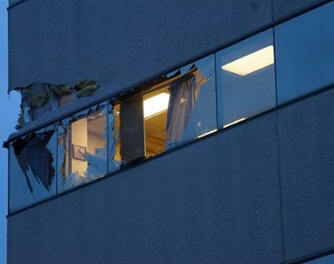 The Cessna 172 first struck the Brady Building on the forth floor and then hit the Whale Building which houses District Attorney's office and state departments of Law and Corrections. The fire department reported the buildings did not incurred structural damage, the exterior of the buildings were mostly impacted and at the time the buildings were empty of workers. Several downtown blocks were taped off, from I Street to L Street and two intersecting avenues Third and Fourth avenues and will remain for the next several hours according to fire officials. 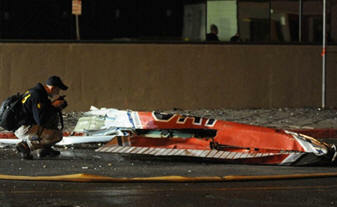 One witness reported "I seen the plane coming in and it did a total complete turn and then boom. It flew over us twice and then crashed. It was just way low, and then it started sinking on in." Anchorage Fire Department Assistant Chief Alex Boyd said there were no injuries on the ground and the aircraft occupant is the only fatality that they know of. Boyd also said the Cessna 172 also struck an electrical transformer on the outside of a building when it crashed, which forced authorities to shut down power to the area. The fire was extinguished by 6:53 AM.